Impatica Showmate - Powerpoint presentations from your handheld | BlackBerry Blast! Impatica Showmate is a pocket-sized device that weighs less than three ounces and allows you to project Powerpoint presentations from your Blackberry or handheld. ShowMate enables mobile professionals to travel with nothing more than a wireless handheld on their hip and a ShowMate in their pocket. 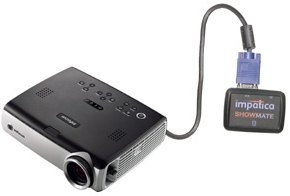 Full-featured PowerPoint presentations can now be viewed on the handheld or projected wirelessly by connecting the ShowMate to any projector or monitor. Presenters can roam freely to engage the audience, navigate to any slide to answer a question or emphasize a point and even view their notes on the handheld while presenting. The ShowMate transforms the handheld into a wireless remote control and personal teleprompter�the ultimate presentation tool. Impatica Inc., announced that Impatica ShowMate has won the Most Innovative Wireless Device award in the Andrew Seybold Choice Awards 2007. Andrew Seybold, Inc. is a wireless industry consulting firm that advises both Fortune 1000 organizations and emerging companies. At the annual Andrew Seybold Choice Awards this week, the key themes were "imagine," "innovate" and "impact". The awards recognized innovative products, businesses and concepts that are making or have the potential to make a positive impact on wireless mobility. Andrew Seybold Award! "Each of this year�s award winners have made significant progress in simplifying the user experience, which is critical to expansion in the wireless industry," said Andy Seybold, President and CEO of Andrew Seybold, Inc. "Impatica ShowMate goes a step further by adding a critical capability for the mobile professional - the ability to deliver PowerPoint presentations from their mobile device without having to drag along a laptop." "What a great honor," exclaimed Michael Doyle, Chairman and CEO of Impatica Inc., "to win the Most Innovative Wireless Device category in the Andrew Seybold Choice Awards. This award is a tribute, not only to all of the dedicated employees at Impatica, but also to our strategic partners at RIM, Sony Ericsson, Palm and Microsoft and to our numerous customers, distributors and carrier partners who have consistently provided insight, encouragement and guidance in the development and evolution of the ShowMate."